Comet 203963A Single Sprocket Centrifugal Clutch for Mini-Bikes, etc. | 4" Dia., 11 Tooth, #35 Chain, 3/4" Bore. Comet 203963A, LA 400 Series Chain Clutch. 4" Dia., 11 Tooth, #35 Chain, 3/4" Bore w/ 3/16" Keyway. Includes Bushings/Washers and set screw. Straight centrifugal rotor mechanism. COMET: 4 CLUTCH S4011-75-35B. Rated for up to 8HP. Engages at approx. 2000RPM. Comet 206169A automatic centrifugal clutch. Comet Industries 206169-A. SCS 400 Series Drive Clutch. Comet 206169-A automatic centrifugal clutch. Comet 206169A. SCS 400 Series. #35 Chain, 1" Shaft Bore, 12 tooth. Comet 206170A, Comet SCS 400 Series. 10 Tooth. Comet 206170A: Comet SCS 400 Series. #40/#41 Chain. 1" Bore, 10 teeth. 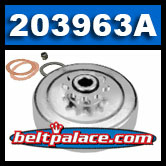 Replaces Manco/American Sportworks (ASW) Dominator clutch Part# 4335.